What does Team Fortress 2 need more of? Besides hats, that is? Guns! TF2’s Gun Mettle update is now live, and it’s a limited-time, paid campaign that sets various goals for players, such as getting a kill with a reflected projectile as a Pyro or surviving 1,000 damage in a single life as a Heavy. Your reward for fulfilling your contracts will be a shiny new weapon with a “uniquely placed paint job so that it will always look a little different from anyone else’s.” As with any TF2 weapons, these shiny bad boys won’t provide gameplay advantages, as explained in the FAQ. 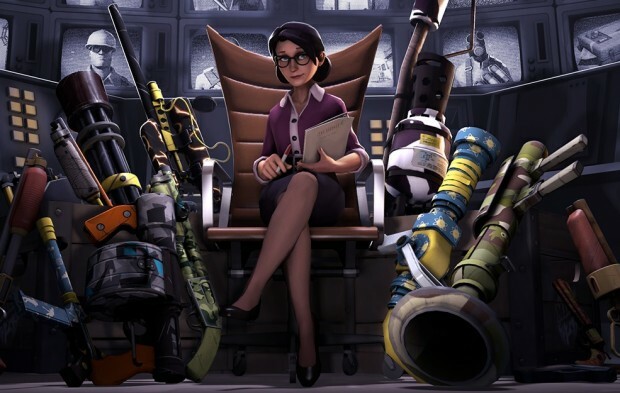 A portion of the proceeds from Gun Mettle will go to TF2’s mapmakers, who also get a boost with the Maps Workshop Beta, where they can upload their creations and get instant feedback or just browse through what the rest of the community has concocted and download custom maps to their servers. The campaign itself costs $5.99, but you can go and read the accompanying comic for free, and it’s as good as you’d expect from Valve and TF2. is anyone play this wardrobe simulator? f u c k this crap and valve too!!!!! soon…. O v e r w a t c h is comming!!!!!!!!! Calm the f u c k down, scrub. Something Valve does always right, Hats(cosmetics). They have mastered the art of shoving cosmetics down our throats.